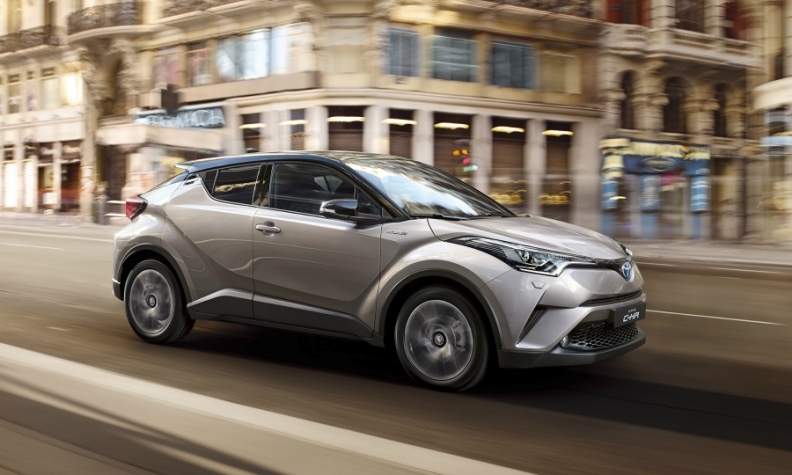 Toyota's German sales were boosted by the new C-HR crossover. FRANKFURT -- German new-car sales rose 13 percent in May on two extra selling days and strong sales to business fleets. Registrations were 323,952 in May, according to data from the KBA motor transport authority, published on Friday. Fleet sales grew 16 percent, nearly double the 8.5 percent rise in private demand, the KBA said. Sales of diesel-powered vehicles fell 1.4 percent as politicians debate imposing bans on diesels in some cities or refitting older engines with better emission controls to tackle pollution. Gasoline car sales rose 23 percent. The diesel share of the overall German market shrank to 40 percent, the KBA said, while the share for gasoline cars was 57 percent. Market leader VW brand's registrations rose 8.8 percent while No. 2 Mercedes-Benz saw sales jump 25 percent. Registrations at third-placed Audi rose 1.4 percent. No. 4 Ford's volume increased 23 percent, while BMW rounded off the top five with a 6.9 percent rise. Other winners in May were Fiat brand, whose sales leapt 38 percent, and Toyota, which saw a 37 percent jump in registrations as the brand benefited from the new C-HR crossover, which launched earlier this year. Opel's volume rose 3.9 percent. Sales PSA Group's DS upscale cars plunged 28 percent and Daimler's Smart unit saw sales fall 10 percent. • Download PDF, above right, for May, 5-month sales in Germany by brand. Through May, German registrations are up 4.7 percent to 1.45 million. Germany is the latest big European market to report strong May sales. Registrations rose 9 percent in France, 8 percent in Italy and 11 percent in Spain. German sales May, 5 months.